Chris Porter will be allowed to leave Bramall Lane on a free transfer as Nigel Clough paves the way for a fresh influx of attacking talent, writes James Shield. 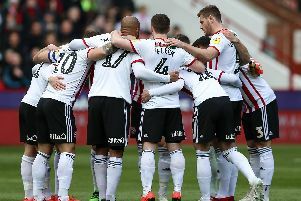 The Sheffield United centre-forward is holding talks with two unnamed clubs after making only five appearances this season. Sources north of the border told The Star last night that Porter rejected the opportunity to join Scottish Premiership outfit Ross County after the transfer window opened earlier this month. But with Chris O’Grady and Gary Mackay-Steven known to feature on Clough’s wanted-list, the 31-year-old has been informed United are unlikely to demand a fee for his services. Porter has scored 23 goals in 69 starts for United since being signed by Clough’s predecessor Danny Wilson on the eve of the 2011/12 campaign. However, despite emerging as a driving force behind their march into the FA Cup semi-finals last term the arrival of Marc McNulty and Michael Higdon from Livingston and NEC Nijmegen respectively has seen him become an increasingly peripheral figure with the League One club. Stephen McGinn and Neill Collins also face uncertain futures in South Yorkshire although the latter has publicly expressed a desire to force himself back into contention rather than explore the possibility of a temporary move elsewhere.